Kamala Harris Went to Prison So Others Won’t Have To; The freshman senator is determined not to let criminal justice reform die on the vine. Democratic up-and-comer Kamala Harris visited just about every corner of California during her successful 2016 campaign to take over Barbara Boxer’s seat in the US Senate, and she’s kept it up somewhat since taking office. But on a recent, sweltering July afternoon, I accompanied Harris to a place where no senator has set foot for at least a decade. 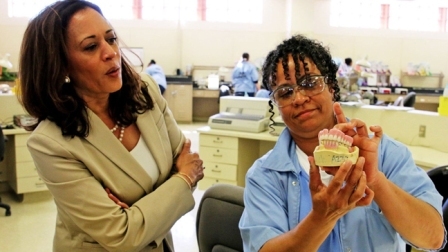 The rising incarceration of women is of particular concern to Harris. A studypublished last year by the Vera Institute found that, since 1970, the number of women in jail has increased at a rate 14 times that of men. Women who wind up behind bars are uniquely vulnerable, according to the report, given that about 4 out of 5 are mothers—and often are saddled with raising children alone, in addition to battling the scourges of addiction or poverty or joblessness. Back in Chowchilla, flanked by a smattering of aides and prison officials, Harris enters a conference room in the prison’s mental health wing where chairs and low-slung black leather sofas have been arranged in a circle. Also present are four inmates chosen to meet the senator and discuss the ins and outs of their lives here. “If you were going to advise me on how to talk about what’s doing on the inside,” Harris asks the prisoners once everyone is settled, what would they say? Harris’ aides told me that when their boss addresses lawmakers this week, she wants to get them thinking about the deeper problems that land people behind bars—at least half of incarcerated women have previously experienced at least one traumatic “event” (childhood sexual abuse, domestic violence), and 82 percent of female prisoners report some drug or alcohol dependency, according to the Vera report.